The most recent U.S. Census indicated that millennials already outnumber baby boomers by more than 15 million. Population demographics and spending trends are changing fast. 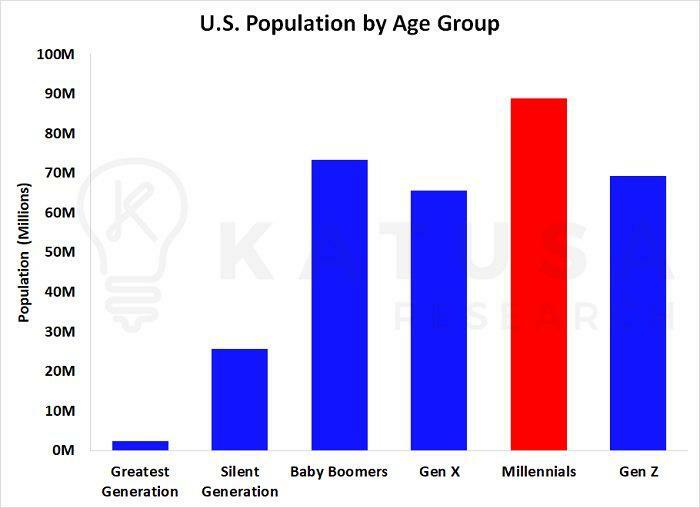 As you can see in the chart below, the young demographic (the millennial generation in red) has taken over as the largest population group from the baby boomers. Today, investors want to invest in an industry with super-fast growth that has a large young audience of Millennials. And let’s not forget the next up and coming population group – Generation Z (those born in 2001 and later). According to data compiled by Bloomberg, Generation Z will overtake the millennials in population number sometime by 2020. The shift in numbers from boomers to millennials and eventually to generation Z comes with a massive shift in dollars. While baby boomers’ spending is being phased out, millennials’ spending is rapidly taking over as the driving force of the economy. I see this generational “changing of the guard” happening in my own office. For the first 15 years of my career, I was the “young gun” in the resource sector. Now that I am one of the largest financiers in the industry, I find myself the oldest person in my own office and have the grey hair to match. Everyone else in my office is a millennial. And the nominal spending power at their respective ages is the highest of their peer generations. As the chart below shows, millennials account for a bigger share of the spending on cell phone services, eating out, and transportation than the baby boomers and Gen X-ers do. Anyone not paying attention to the economic rise and coming spending power of millennials and Gen Z will regret it. It’s one of the greatest cultural, demographic and economic shifts in history. Netflix was a tiny company at the time. Only trading at about $4 a share. But Mr. Keyes wasn’t paying attention to the beginnings of a massive demographic, technological and cultural shift. One that would see millennials cutting the cord and turning to subscription-based streaming video. Within two years, Blockbuster was bankrupt. Netflix is now worth about $400 per share. Or a 10,000% rise in under a decade. People who missed out on the Netflix rocket ship regret not seeing the direction millennials were moving earlier. Fortunately, they’ll get another chance. And it’ll likely be even bigger this time. But thanks in large part to the relationship habits of millennials, the U.S. divorce rate has been sliced by 18% from 2008 to 2016. Millennials are taking their time to get married. They’re finishing school. They’re getting their careers on track and they’re getting their finances in order. Millennials are turning to On-Demand Education like Coursera and YouTube versus traditional methods of schooling. They were among the first groups to embrace the “Gig Economy” and solicit their skills to make money on the side through sites like UpWork and Freelancer.com. Instead of going to the grocery store, they use food delivery services like Skip the Dishes and meal prep delivery services like Fresh Prep. Instead of taking cabs and staying at hotels, they take Uber and stay in AirBnB’s. The youngest ever self-made billionaire is a millennial by the name of John Collison (aged 27) who founded the online payment company, Stripe. And perhaps the next youngest self-made billionaire will be an Instagram and social media celebrity – Kylie Jenner. I’m sure by now the name (part of the Kardashian clan) needs no further explanation. Next week Katusa Research will release a series of editorials in our Prepare to Profit Series. It will cover one industry that is rapidly emerging as the next big bull market. It’s a market where crypto was in 2016, meaning few even knew it existed. It’s where the cannabis market was in 2014. Now, I bet you’ve wished you had a chance to go back in time and load up on cryptos and weed stocks. I bet you wished you could get up to speed quick and deploy capital in some quality investments in those sectors, at the time. Because I will reveal what this emerging sector is and also my favorite pick. Marin Katusa, an accomplished investment analyst, is the senior editor of Casey Energy Dividends, Casey Energy Confidential, and Casey Energy Report. He left a successful teaching career to pursue analyzing and investing in junior resource companies. In addition, he is a regular commentator on BNN and he is a member of the Vancouver Angel Forum where he and his colleagues evaluate early seed investment opportunities. Marin also manages a portfolio of international real estate projects. Using advanced mathematical skills, he has created a diagnostic resource market tool that analyzes and compares hundreds of investment variables. Through his own investments, Marin has established a network of relationships with many of the key players in the junior resource sector in Vancouver.